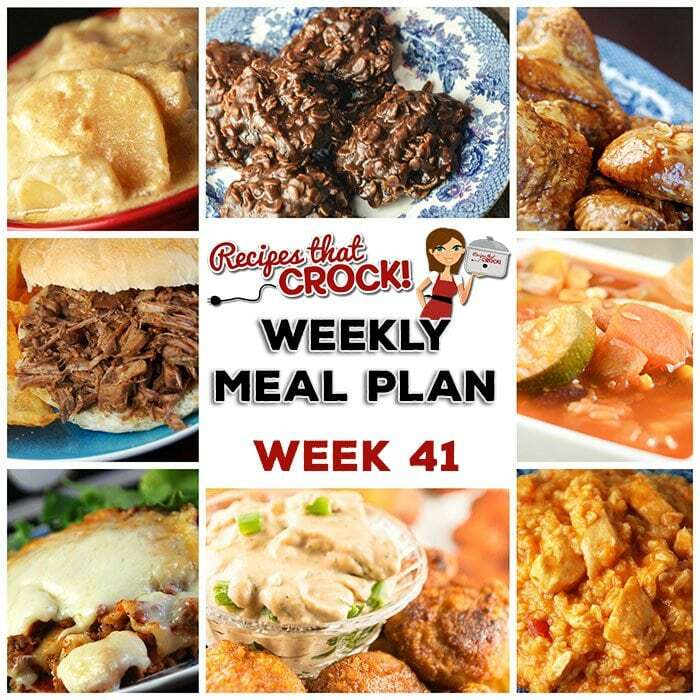 Meal Planning: Weekly Crock Pot Menu 41 - Recipes That Crock! This week’s weekly menu features Crock Pot BBQ Steak Sandwiches, Cheesy Salsa Crock Pot Chicken Rice, Crock Pot All-Day Veggie Soup, Crock Pot Honey BBQ Chicken Wings, Crock Pot Saucy Potatoes, Crock Pot Cheesy Lasagna, Crock Pot Blueberry Coffee Cake, Crock Pot Creamy BBQ Ranch Dip and Crock Pot No Bake Cookies. Cris here. We had a blast with last week’s menu and (on-the-road) chat. This week we are talking about trying reader recipes and our electric pressure cookers (chat video coming soon).